Lewis Hamilton is reportedly poised to put pen to paper on a new Mercedes deal that will see him pocket an incredible £770,000 a week. 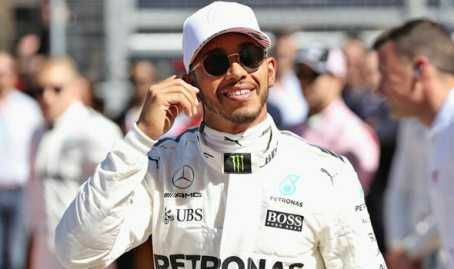 Hamilton, who won the fourth F1 title of his racing career last year, is under contract with the German manufacturers until the end of the 2018 campaign. And he’s been locked in talks with Mercedes chief Toto Wolff throughout the off-season about extending his stay with them. Hamilton’s deal is thought to have been held up by extended negotiations over pay and how many days he must work. The latest reports suggest he is due to sign on the dotted line before this weekend’s season-opening Australian Grand Prix. According to The Sun, Hamilton is 'set to sign' a contract that will be worth £120m if he sees it out in full. The terms of the agreement will tie him down to Mercedes for an initial two years. And he will have the option to stick with them for another season - taking home £770,000 a week in the process..
Alongside being Britain’s most successful F1 driver ever, Hamilton will be its best-paid sportsperson. Wolff is said to be eager to have the deal finalised before Saturday’s race in Melbourne. Ahead of the Australian Grand Prix, Hamilton has admitted he still doubts his own ability at times. "I still love racing, I still love the challenge of every year getting myself in shape," he said. "But I always have this question of if I can still drive before I get to the first test— can I still do it? Do I still have it? I love that unknown. "People say ‘it’s never gonna go’ but maybe one year you don’t feel good in the car — so I’m always excited by that. "At the end of the season of course I am wondering to myself ‘do I want to keep racing?’ I have to ask myself that, for sure."